She was impossible to miss. While nearly 100 other megayachts were tied stern-to along the quays in Monaco, and while some of them were more than double her length, Ocean Glory grabbed everyone&apos;s attention and made it hard for them to turn away. Hardly a square inch of Ocean Glory went unrestored by Amico & Co., and for good reason. Not that any of us journalists and other dockwalkers at last September&apos;s Monaco Yacht Show were complaining. 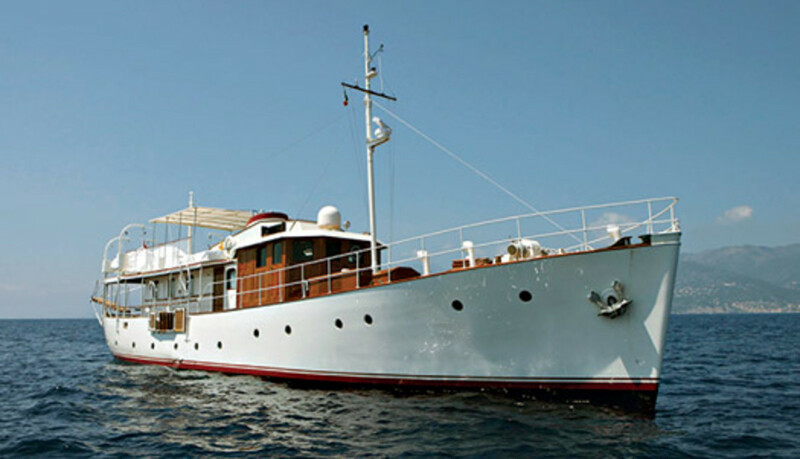 Her profile is easy on the eyes: a classic 1930&apos;s design with a plumb bow and lacquered teak topsides along her nearly 83-foot length. Once I&apos;d crossed her passerelle to her equally classic decks and interior, I fully understood why the yard that refitted her not only took three years to do the project, but also why it did so on its own dime. 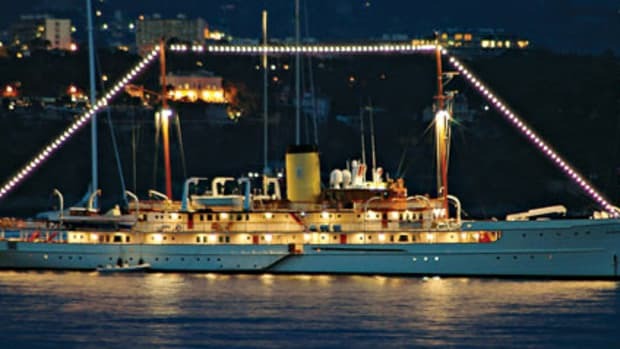 The yard in question is Amico & Co., based in Genoa, Italy. While the family-run yacht refit and repair business opened in 1985, its roots go back to 1885, when the Amico clan started repairing naval vessels. (The company maintains a commercial branch to this day, too.) 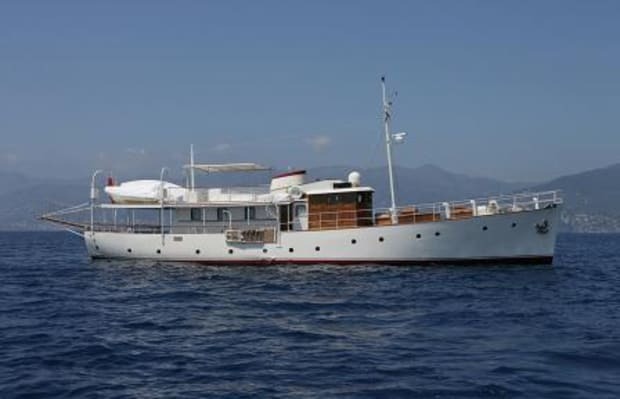 Over the past 20 years, Amico has serviced a number of megayachts, including a handful of classic builds. Which is one of the reasons why four years ago, Ocean Glory, then known as Umbrina, was taken to its facility for a refit. 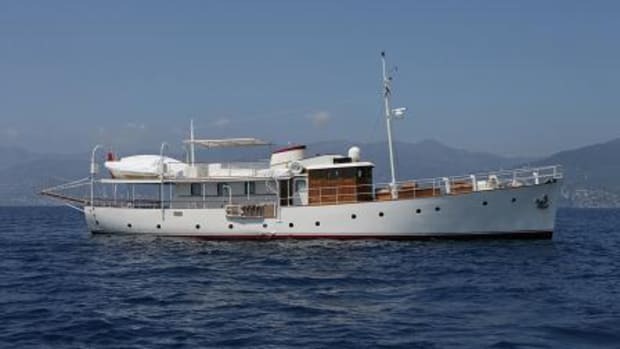 The yacht, originally launched as Destiny in 1935 by Glasgow-based Yarrow & Co., went through a handful of owners (and names) prior to 2001, and she was starting to look worse for wear. 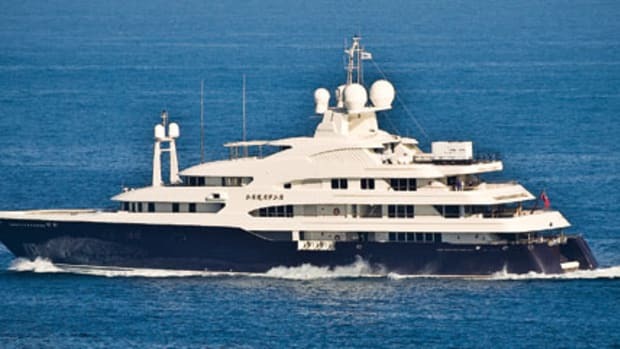 However, according to Alfonso Postorino, Amico & Co.&apos;s business-development manager, the owner still hadn&apos;t made a decision about what he wanted done after a year&apos;s time had passed, so the yard offered to buy the yacht, and he accepted. "We decided to start the refitting on our own because it was a real shame to let this beautiful yacht become a wreck (and she was really close to being one)," Postorino says. Anything that wasn&apos;t salvageable was replaced with materials that were in keeping with the yacht&apos;s era. But much of the original woodwork and even equipment was restored. For example, while the wood sole running from the saloon to the wheelhouse is new, and while the wood beams running along the overhead are as well, the slide-up windows in the saloon are original—right down to the handles. The teak paneling lining the exterior of the wheelhouse also dates back to 1935, though now it glows from under layers of lacquer; when Ocean Glory arrived at Amico, the wheelhouse fascia was coated with white paint. And speaking of the wheelhouse, it still boasts the original compass with an oil lamp—and it still works—but the rest of the instruments here are thoroughly modern-day electronics. Perhaps most impressive of all, however, the twin 150-hp, eight-cylinder Gardiner engines that were installed in 1955 to replace her aging first set of powerplants were not replaced but "just" overhauled. Ocean Glory emerged from the yard in July and has been spotted everywhere from the South of France to the Ligurian coast of Italy since then. After Amico & Co. invested so much in this refit, surely it&apos;s offering the yacht for sale, yes? Actually, no. Postorino says the yard is keeping her for marketing purposes and offering her for charter. In fact, she completed six weeks of charter last summer, and at presstime Postorino said she had five booked for this year. 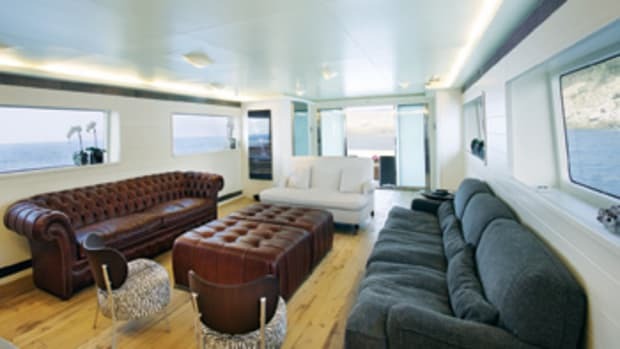 Floating Life, a firm with offices in Switzerland and China and whose founder has 15 years of experience in charter and yacht management, has included Ocean Glory in its fleet. According to Barbara Tambani, chairman of Floating Life, the yacht&apos;s "special character really appealed to us." No doubt that appeal is spreading as you read this. 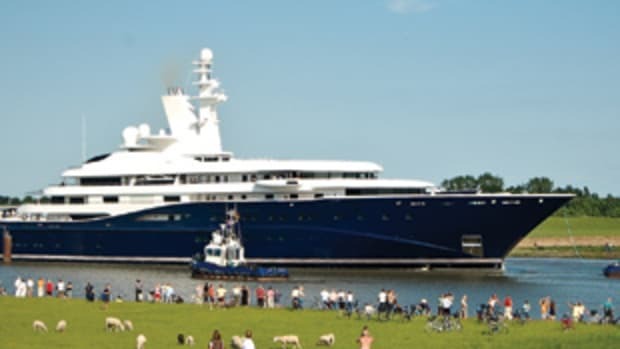 Feadship launched the second yacht in its new F45 semicustom series in October. The 146&apos;6" Harle features an Art Deco-inspired interior design that the shipyard, Royal Van Lent, refers to as the Miami decor package. (The F45 series offers owners the choice of four design styles: Monaco, Miami, Milano, and Nautical.) Harle, like the rest of the yachts in the series, has all four guest staterooms as well as the owner&apos;s suite on the main deck, and the owner&apos;s stateroom features a skylight more than ten feet overhead. For further information, or to take a virtual tour, visit F45 Vantage. If you&apos;re a fan of any sport that involves the water, and particularly if you&apos;re a fan of the Olympics, be sure to tune into the sailing competition this summer when the Games are held in Beijing. You&apos;ll see John Dane, CEO of Trinity Yachts, racing a Star Class boat. Various media have already picked up the story, though focusing on the fact that Dane will likely be the oldest athlete participating in the Games, at age 58. No word on whether any of Trinity&apos;s clients have offered him a week&apos;s stay onboard their yachts if he nabs the gold medal, though.